Sie haben eine Frage zum Hanoi Brother Inn Hotel? Die in der Region Altes Viertel überaus günstig gelegene Unterkunft "Hanoi Brother Inn Hotel" ist die ideale Basis, um in Hanoi auf Entdeckungstour zu gehen. Nur 5.3 km vom Flughafen entfernt, lässt sich die 2.5-Sterne-Unterkunft nach der Landung einfach erreichen. Aufgrund ihrer günstigen Lage bietet die Unterkunft den perfekten Ausgangspunkt zu den wichtigsten Attraktionen, die man gesehen haben muss. Das Hanoi Brother Inn Hotel hat sich mit seinem herausragenden Service und einer breiten Palette an Einrichtungen dazu verpflichtet, Ihnen den Aufenthalt so komfortabel wie möglich zu machen. Eine Auswahl an erstklassigen Einrichtungen, darunter Gratis-WLAN im Zimmer, Taxiservice, Ticketservice, 24h-Rezeption, Gepäckaufbewahrung und viele weitere, stehen Ihnen zur Verfügung. Alle Zimmer verfügen über durchdachte Annehmlichkeiten, um Ihnen einen erstklassigen Komfort zu bieten. Außerdem sorgt das umfangreiche Angebot an Freizeitaktivitäten in der Unterkunft dafür, dass es Ihnen niemals langweilig wird. Das Hanoi Brother Inn Hotel garantiert einen entspannten und komfortablen Aufenthalt in Hanoi - eine clevere Wahl. Das Mindestalter für Gäste beträgt 1 Jahre. We had a good stay, the staff was very friendly and tryed their best to make our stay as confortable as possible. The room wasn't that nice, because there was a wall in front of the window. AC, hot shower, wifi everything was there and well working. Wir waren einige Tage in diesem Hotel und haben die Freundlichkeit des Personals sehr genossen. Besonders mr. Hai hat uns zwei besondere Touren nach sapa und zur halong Bucht beschert. Wir würden wieder kommen! Insgesamt hatten wir einen angenehmen Aufenthalt im Brother Inn. Das Personal war sehr freundlich und aufmerksam (sie beachten mir bzw. zu meinem Geburtstag einen Kuchen aufs Zimmer und jodelten ein Geburtstagsständchen für mich. Das war sehr lieb! :)) Das Frühstück war ebenfalls gut, allerdings hatten wir leider Pech mit einem sehr feuchten Zimmer. Wenn man hinein kam roch es nach Schimmel. Das Bett war äußerst klamm, sodass wir vorm Schlafengehen Handtücher untergelegt haben. Wir wissen aber nicht ob das in jedem Zimmer der Fall war (unser Zimmer war Nr. 302). Sehr schade um das eigentlich sehr gute Hotel! Super freundliches und hilfsbereites Personal, was auch keine Touren aufschwätzt sondern berät. Die Lage ist als Ausgangspunkt zur Besichtigung von Hanoi optimal alles ist ohne Probleme zu Fuß erreichbar. Lediglich die Sauberkeit der Zimmer lässt wünsche offen, das große Problem hier ist allerdings die enorme Luftfeuchtigkeit und daher feuchte Zimmer, Möbel und Betten ob das wie uns erklärt wurde nur am Wetter liegt oder nicht doch eher an der Bauweise ist fraglich. Für den Preis ist aber alles in Ordnung. All in all it's a super nice place with a very motivated team. Gary and his brothers are very helpful and give great advice and recommendations for not only tours but also restaurants in the area. We booked a great cruise to Halong Bay through them and could leave our luggage without any problems. They also offer an airport shuttle for 15$ a car, which is about the same for a taxi, just without getting scammed. Nice place, great hosts, can't complain when it comes to value for money. This is my third time staying here. I stayed here a year ago before and after a trip to Sa Pa (and they held my bags which I really appreciated) and loved Hanoi so much that I came back, so I naturally booked Hanoi brothers again and it felt like coming home! Very comfortable rooms, great AC and wifi, hot water (most of the time) and a good free breakfast. The only thing I’d say is that the staff tries a little too hard to sell you on organized trips, but from what I can tell, they are of good quality, so my friend may actually take them up on one. 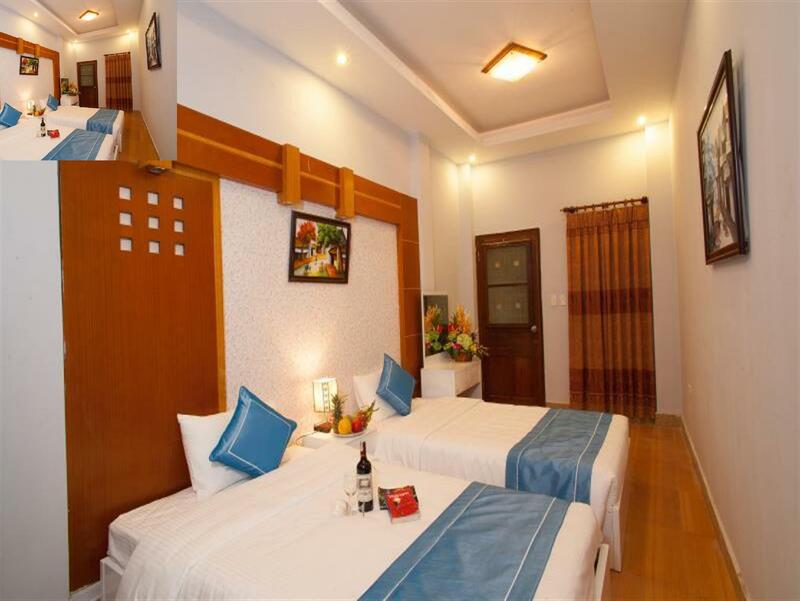 Great location, close to all shops, eating areas and the Night Market. Very accommodating staff. 'Gary' assisted us with our overnight travel and cruise at Halong Bay. Very easy and smooth. Freshly cooked breakfast. Very warm and friendly. Very nice place for the breakfast and location. The staff was so nice and accommodating. The only part that was bad was the rooms (especially) the bathroom could use a real deep clean. That being said for this price range in Hanoi it is overall a good place. For location wise, this hotel is the best to me because there are many famous local food located around the hotel and night market which opens every Friday is also few minutes of walking distance from the hotel. The hotel is easy to search unlike many other hotels where they located in dark alley. Breakfast: It was awesome! very delicious and we loved it so much. Room: It was clean and comfy. Staff: staff is very helpful and nice. I think this hotel is the best among all. This is quite an old hotel with all the fixtures being quite tired and it is very basic but despite that it is actually very clean (no mould smell or stuffiness). 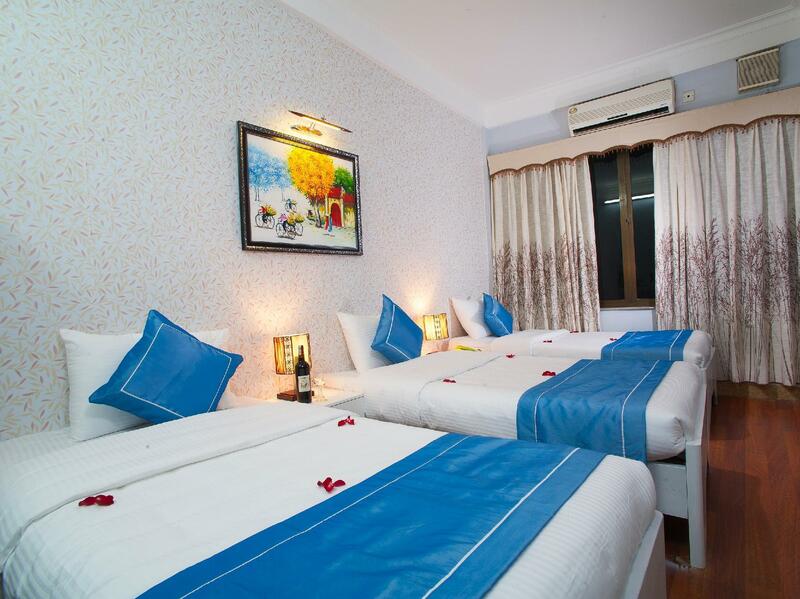 I have stayed in quite a few places in Hanoi and definitely have found others that are newer or with a bit more going for them, even in the budget range but if you end up at this one it isn't the end of the world. It's the usual trifecta for breakfast, baguette, pancakes or pho. The pancakes for breakfast are very odd, the typical Vietnam ones but even more rubbery, but the pho is good. The staff are very, very helpful and accommodating and speak excellent English. I'm not sure about other languages. The wifi is strong and fast with what seems to be separate connections for each room. The hot water is good too. We stayed in a double on the highest floor (maybe 5th? I don’t remember) and there is a rooftop party next door every night til 11ish. It is extremely loud so if you plan on sleeping before 11pm then you may want to request for another floor. Provided breakfast was delicious every morning. Staff are friendly. Phillip and the crew welcomed us with big smiles which carried through for our whole stay. All staff were extremely helpful and friendly, can’t fault them! The location was great, right in the midst of hectic Hanoi with plenty of options for food nearby and a short walk to the lake. The breakfast was basic but nice. You are able to order from a small list of eggs and pancakes and then help yourself to fruit/tea/coffee. The coffee was disappointing though! Had to seek our caffeine fix elsewhere. Room was simple yet clean. The shower was super hot, a welcome change from our previous hotels! Overall, it’s a great cheap place to stay with wonderful staff. Would highly recommend! both, buddy inn and brother inn has excellent stuff, all time ready to help. take room 402, its with private balkony , streetview. If you want to have a bigger room and bigger balkony, choose the one below. Thx a lot 2 the stuff! First day they placed me on the rooftop room which wasn’t really like what’s on the photos and the noise from the next door hostel was just terrible enough to keep you awake until 11pm. So, if you want to get an early good night’s rest, please avoid that room. Although, as requested they promptly transferred me next day to a room downstairs which was definitely so much better than the previous and without any noise. The staff were great and they helped me out with my Halong Bay tour which was amazing btw! All in all, it was still a good stay! Cheers! We stayed here for 1 night and then went to Sapa for a trekking tour and booked a further 2 nights with Hanoi Brother Inm because we loved our stay here. The staff speak fantastic english and are very friendly and helpful. They are always on the lookout to help you in any way. The complimentary breakfast is cooked to order and includes tea coffee fruits. 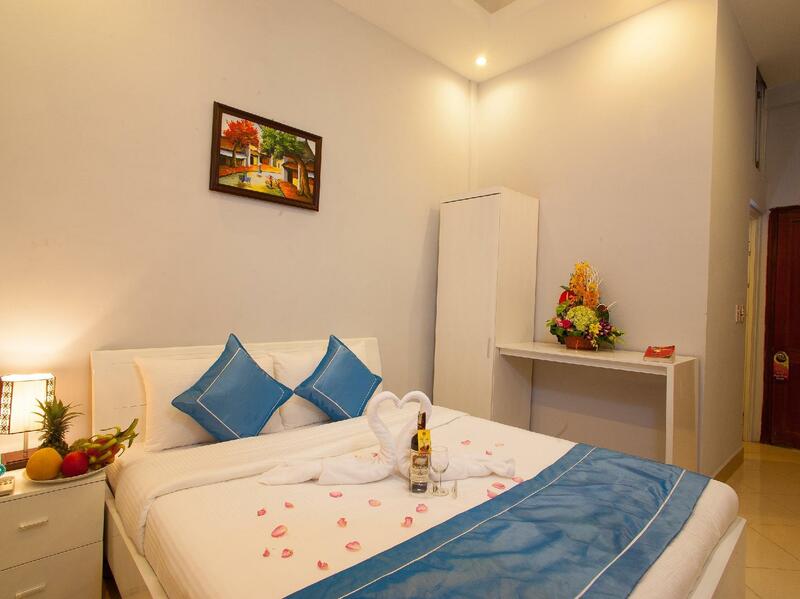 The rooms are of a good size and bathrooms were the best layout we had in Vietnam. We were able to leave our bags with the hotel while we spent 3 days in Sapa. Would definitly stay here again!!! It would be great if i could stay here longer. The room are bigger compared to other hotels and it's value for money since you had an attached bathroom. The staff speaks very good English and they introduced the nearby attractions to you. If you would like to know more tour information, just approach any of the brothers. They give us a breakfast take away since we have to leave early to the airport. 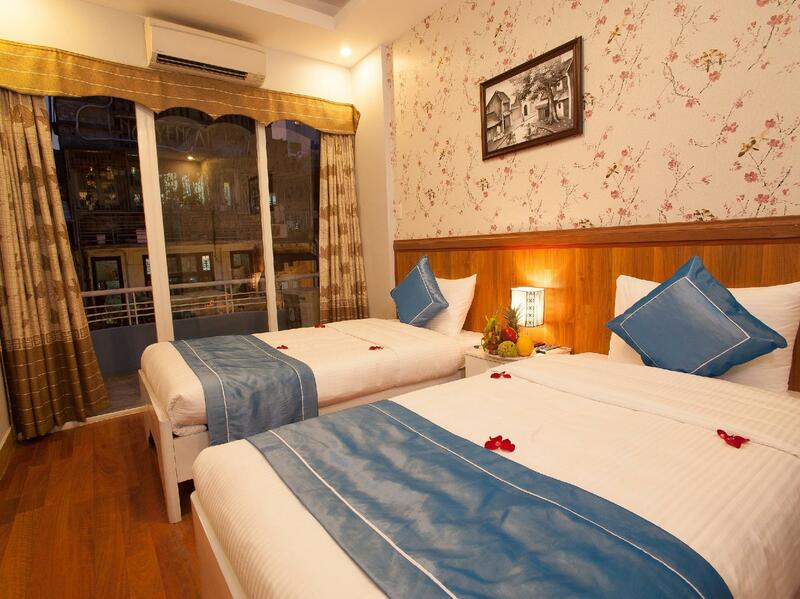 It would be a good choice to choose this hotel for your first night in Hanoi. Taxi to airport is USD15 (a bit pricey compared to other hotels, it's not a taxi driver, perhaps a friend of the hotel staff). Nevertheless, we enjoy the short stay here. Perfect location if you want to be central to Old Quarter in Hanoi. It can be loud because it is around other hostels and close to a main street. The staff makes sure that you have everything you need. They are the reason to stay here, they will take care of you very well.